The Rugby World Cup, which is being hosted by England, kicks off on 18 September and brands are clamouring to show their support. Campaign showcases some of the best ads. The TV ad shows international rugby stars from across the world pretending to be players from the home nations in order to fool shopkeepers around the UK into selling them Lucozade Sport. The spot positions the drink as the secret weapon of the home nations. Brief: To ensure engagement and awareness levels remain high throughout the Rugby World Cup. The ad is part of a £9 million campaign from Lucozade, which includes 30/60’ TV ads, digital content, national sampling, in-store activation and on-pack promotions. Ahead of the Rugby World Cup, Guinness, has released a brace of films celebrating inner qualities like courage and resilience. One of the films trains a spotlight on Gareth Thomas, the former Wales captain, as he talks about coming out as gay to his teammates. Guinness is the official beer of partner of the English, Irish, Scottish and Welsh national rugby teams and also sponsors Leinster, Munster and the London Irish at club level. An underdog story that mirrors New Zealand’s hopes for the Rugby World Cup 2015. The 1905 winning rugby team is the focus of the campaign. The ‘Originals’ were the first New Zealand team to tour the UK, losing only one in 35 games. Brief: To inspire New Zealand through Steinlager for the Rugby World Cup. Comedian Jack Whitehall is schooled in rugby by a who’s who of England legends, including Jason Leonard, Maggie Alphonsi, Lawrence Dallaglio, Martin Johnson and Jason Robinson. Samsung is an official partner of the Rugby Football Union and its ads are themed around key attributes of rugby, including ‘power’ and ‘speed’. Brief: To demystify the game and get people excited about rugby. To highlight the role technology plays in sport. "Wear the rose" shows boyband Take That carrying team members on their shoulders, symbolising fan support. It also features a cameo from Jonny Wilkinson, the hero of England's 2003 World Cup triumph. 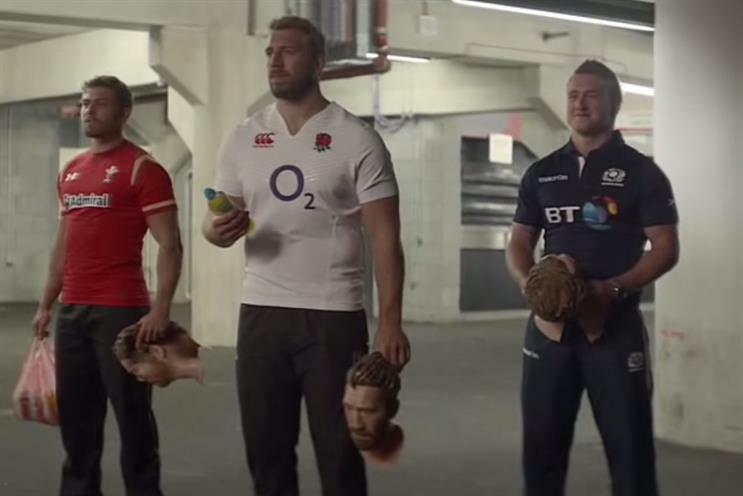 As part of the campaign, O2 has also rebranded its 377 shops with the rose logo and hung 50,000 England rugby jerseys on giant washing lines around the UK. Brief: To raise the profile of O2. The telecoms brand has been an England Rugby sponsor since 1995 but it is not an official sponsor of the tournament, and so it is restricted in terms of brand visibility at the event. Movie star Charles Dance is in the Twickenham changing room delivering a rallying cry to a team of international rugby stars. It features fans from across the country, as well as referees, mascots and other characters who will play a part in the tournament. Brief: To launch the Rugby World Cup and the tournament ticketing campaign. The ad shows rugby played at its grass roots and is accompanied by a poetic voiceover. Brief: Land Rover as an official sponsor of the Rugby World Cup has focused on highlighting grass roots rugby. A player who appears to be Jonny Wilkinson is seen practicing his place-kicking under floodlights. But when he goes for the kick and trips over, he is revealed as a lookalike. The strapline is: ‘It’s not always clear to spot a fake." Brief: To make sure that fans buy official tickets for the Rugby World Cup.